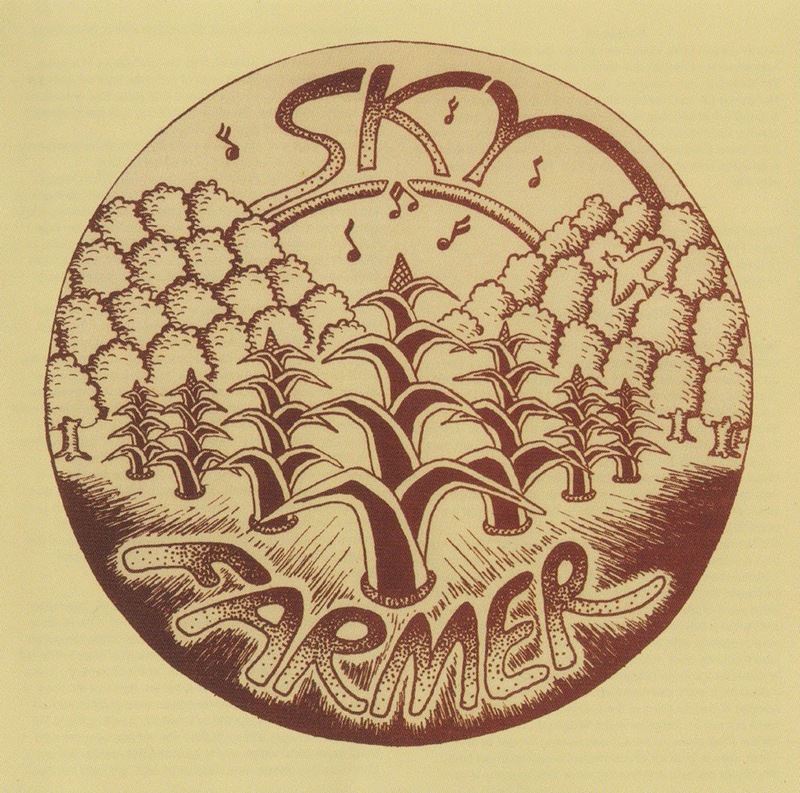 Skyfarmer was created from the ashes of the Mountain Bus Band (a Chicago psychedelic blues rock band), which had gone down in flames in 1971 with the costs of defending it's Sundance LP against a lawsuit from the band Mountain, allegedly over the name Mountain in Mountain Bus. (This despite the tact that Mountain Bus was formed years before Mountain came into existence). Lead guitarist Bill Kees headed for the hills of southwest Wisconsin after the demise of Mountain Bus. He hooked up with Stan Kane. Lee Buch, Jimbo Walsh. 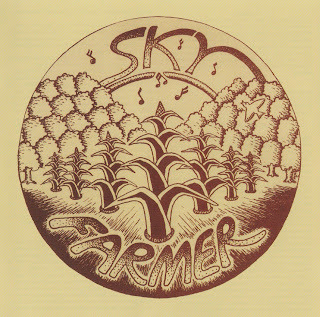 Kim Gitlis and fellow Mountain Bus member, bassist Craig Takehara to form the band Skyfarmer Skyfarmer was to become more than just an R&amp;R band It was also a community. The band's main residence was in a large stucco house with a few outbuildings on an old tobacco farm (renamed Skyfarm by it's new inhabitants) located about 60 miles west of Madison. Wisconsin In this quiet valley, they converted a two car garage into rehearsal space where (in warm seasons with the doors open) soft muiti reflective echoes would bounce back in lush, layered reverberations off me hillsides as the band rehearsed. As time went on, the outbuildings were converted into residences and soon the number of people living at the residence grew rapidly. As Bill Kees put it in an interview in the Wisconsin State Journal, "When I first came up here, I was looking to start another band. There were a lot of small communes popping up out here, Skyfarmer became another. We were among many urban refugees coming out. and we all became part of the cultural landscape." Life at Skyfarm often took on "On Inn bits* Merry Prankster qualities. Craig and Elliott were at one time banned from the communal dinner table as the puns and jokes that emanated nonstop from the duo too often resulted in milk being ejected out of the nostrils of others at the table. The band went through a seiies of transformations (personnel as well as musical focus) until it reached it's final metamorphism with Annie Hat (lead vocals), EHiott Delman (rhythm guitar), Ernest Mansfield (Flute, Sax. Keys) formally of the Mormos band. Bill Kees (lead guitar). Craig Takehara (Bass guitar) and Woody Sims (Drums) formerly of Mountain Bus. Another change was in band management from Kim Gitlis tn Skeets Millard (of the underground paper The Chicago Seed fame) who was to help the band expand from the local club scene. The resulting mix of influences created a unique sound and style and some quite original and eciectic music. This was quite far a field for the Mountain Bus members who were coming from a hard rock/ blues background, as well as for the Mormos members who came from the folk scene in France. 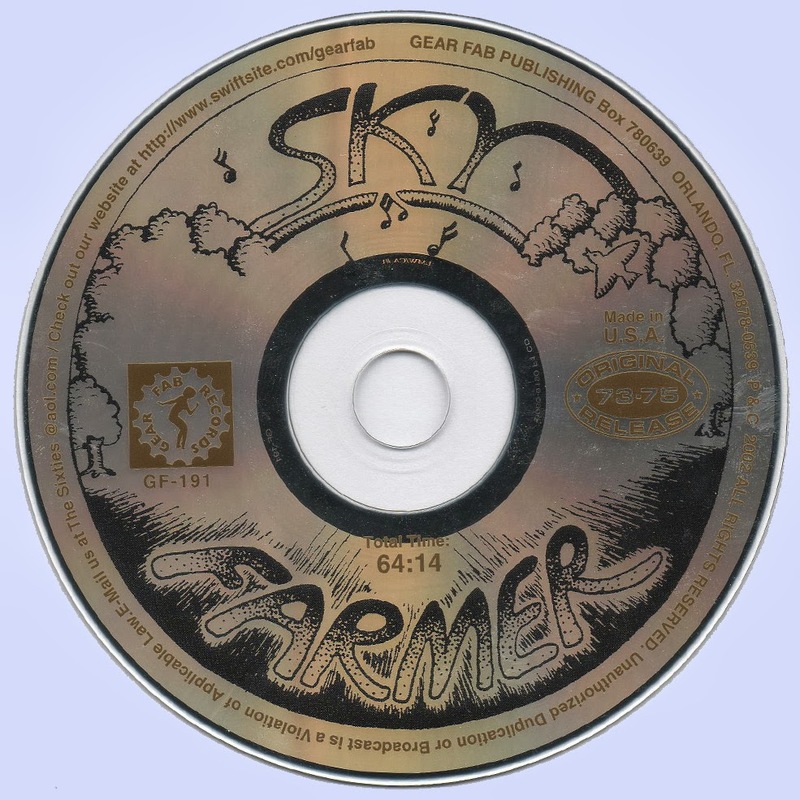 Skyfarmer played in an equally mixed assortment of venues. They developed a devoted tan base locally playing in local rural taverns and Community Halls while expanding out to a tour radius that included four states, playing a mix of dubs in cities and college towns Skyfarmer toured in a modified 64 passenger GMC school bus, which was in constant need of repair but somehow always managed to get the band to gigs. The schedule evolved into as much as 2-3 weeks on the road and 1-2 weeks of local gigs, tending to the gardens and critters, catching up wrth the local scene and grooving on the natural beauty of the hills and valleys of rural southwest Wisconsin. This changed when the band won a long-term gig playing at the Goodman Theater's Chicago production of "The Tooth of Crime". The long absence of the band from Skyfarm caused some problems with trie folks left at home who after awhile felt a bit abandoned. After the band's run at the Goodman, it was back on the road again. By this time, the rigors of the road were taking its toll and band members were getting married. I he band collectively started to break up. Lead guitarist Bitt Kees and manager Skeets MiHard started planning the next band incarnation which was to be a straight ahead rock band Unfortunately. Skeets was killed in an after gig road accident. The shock of his death and the destruction of the band bus and gear weighed hard on the band. Yet, the band played on until the last gig at "Amazing Grace* in Evanston, IL January 6th, 1975. In the last few months of gigs after the accident, Skyfarmer was joined by Rocko Jans (Keyboards) and Joe Habao TexkJor (percussion, of the Hassan Roland Kirk jazz band fame). This added another layer of texture to the musical mix. The band's music was a balance between structured arrangements and improvisational jamming. It was understood that no jam would ever be played the same way twice. However, in the passage of time, themes would evolve and diveige. appeal and disappear or become transformed altogether. After the last gig, Annie Hat Joined up with Rocko Jans to form "Rocko and the Hat" Craig Takehara and Woody Sims joined the "Jim Schwall Band", Elhott Delman had already joined the "Bonnie Koioc Band*, and Bill Kees moved on without Sheets to form the "Broken Winy Band" which continued to work the local club scene for a while, before moving to L.A. Skyfarmer started out playing original songs mixed with covers of rock and country tunes. As time went on, original songs and extended freeform jams became the hallmark of the band. They would often times meet up with other road bands at truck stops after gigs, who would often express amazement that Skyfarmer was able to play original music on the road and make a living at it. Of course Skyfarmer was not making very much money. This was subsistence living at best, but It was fun. In fact, it was family. The commercialization of underground rock music was well under way by this time and Disco and Glam rock were the new thing. The Vietnam War was over, and so was the alternative lifestyle of the communes across the country. Richard Nixon had resigned the presidency in disgrace The innocence of the 50s and 60s had been lost. The great underground FM stations were disappearing and so was the psychedelic and eclectic music scene. But psychedelic music would live on, percolating underground, waiting to emerge again. Their musical styles vary from free-form jams with extensive use of piano, sax, long guitar breaks and Ann's Lindquist beautiful, haunting vocals. The band described themselves as "country blues with tinges of psychedelia" -- a cross between J. Geils and It's A Beautiful Day. Marios: thanks for sharing of! you know how to make my sunday to a happy day, THXS 4 this lossless goodie!